If you sometimes get confused between a colon and a semicolon or a hyphen, dash, or em-dash, then you are not alone. In fact, not only are you not alone, but you join the majority of people in this world who can speak English fluently, but who don't know the first thing about the details of punctuation. Fortunately, for you, WhiteSmoke has developed a state-of-the-art punctuation checker to help you correct punctuation errors in your writing. WhiteSmoke Writer offers a wide range of operations. It will identify missing punctuation, like an absent quotation mark or a missing period – obvious mistakes that you probably just missed due to working quickly, and it will also find and correct less-obvious punctuation mistakes, like a colon that should really be a dash or an apostrophe that was put in the wrong place. One of the benefits of such an elaborate tool is that over time, you will find that your punctuation usage has actually improved. WhiteSmoke's Writer’s integrated punctuation checker won't just correct your punctuation errors without showing your mistakes; rather, it will highlight your errors, offer possible solutions, and even provide writing tips that will help you avoid making those same punctuation mistakes in the future. Think of our program as your very own personal tutor – you'll receive flawless, perfectly punctuated writing and one-on-one English punctuation lessons! Offices, universities, and homes across the world benefit from using WhiteSmoke Writer for their grammar and punctuation checking, as well as text editing. According to Dr. David Spencer, professor of English, punctuation is a little-studied subject that should deserve more attention. "From an early age, schoolchildren are taught how to spell and how to write simple sentences," he says. "However, grammar in general and punctuation, in particular, have been neglected in recent years. Teachers seem to think that students can just rely on Microsoft Word's grammar and punctuation checker and have that be enough. It’s not enough – the program has its limitations and there are no lessons learned from its suggestions. WhiteSmoke's solution offers a dual advantage – it corrects poor grammar and punctuation, and it teaches students how to avoid making these errors in the future." WhiteSmoke’s developers and linguists knew they had to address the multiple shortcomings associated with other punctuation checkers. With this in mind they created WhiteSmoke Writer’s punctuation checker with a variety of advanced features, including the ability to analyze all sentences efficiently for structural errors including missing and incorrectly placed punctuation marks. 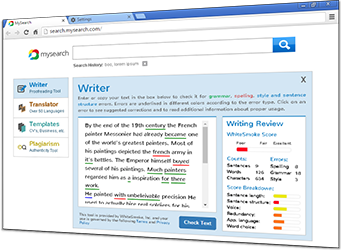 The software compares your written text with its large database of sentences, words and mistakes, and then uses an artificial intelligence algorithm to determine the writing patterns. The program assists novices and professional writers in writing impeccable documents without spending too much time worrying about editing punctuation and rewriting their sentences. It also teaches them a thing or two about the mechanics of the English language so that, in time, they'll make fewer and fewer grammatical mistakes and punctuation errors!